Well, folks 2007 has come and gone. 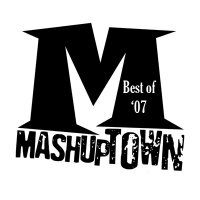 And to help you celebrate the new year, the crew over here at mashuptown got together and put together a Best of 2007 compilation. This was a very tough thing to do as there were so many outstanding mashups in '07 to choose from. And at the rate that some of these producers are pumping out quality bootlegs, it seems that '08 will be no different. Support Mashuptown by taking a quick second and visiting HERE and clicking thru. Peace. So we here at Mashuptown want to wish you a happy and very SAFE new year. Tequila Lip Gloss (Lil Mama vs. The Champs)-DJ Paul V.
Is it just me or is Divshare not working? Nothing I've clicked on for Divshare has worked for me tonight!! Great bunch of music, but where is DJ Earworm's Promiscuous Lola? Kia ora from NZ - Thanks for a wonderful year of mashups ... and that's a great sum-up of my favourites of 07. Was really hoping for more rock based mashups from you guys here at Mtown! Oh well- glad to see a few g'tunes on here. Cheers to a good year! I want to see a Best of Year listing from a site that allows user voting for their top 10 mashups so to speak -- most voted for would make the best of listing.. (could be more than 10 of course). Now that would be cool. Oh, and, I'm lazy, so the new cd is coming eventually. Stay tuned. Looks like a great compilation - can't wait to listen! Thanks for including my "Love Comes Running Up That Hill Quickly"! By far THE BEST site...ever. Thanks for the downloads and the freebies. Artistic expression actually lives on! We can take dissertation writing or mini dissertation. And to note that you are a good students, you should take buy thesis. freebies. Artistic expression actually lives on! If you want to buy real estate, you would have to receive the mortgage loans. Moreover, my brother commonly utilizes a secured loan, which is the most useful. Oh well- glad to see a few g'tunes on here. Cheers to a good year!